On Prints and Printmakers 7 Booklets in Slipcase. New York. Far Gallery. 1962. Limited Edition. Very Good. Edgewear. Limited to 2000 copies. 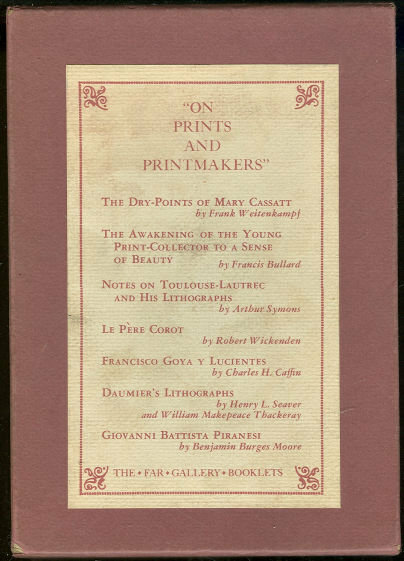 Seven booklets including, The Dry Points of Mary Cassat by Frank Weitenkampf, The Awakening of the Young Print Collector to a Sense of Beauty by Francis Bullard, Notes on Toulouse-Lautrec and His Lithographs by Arthur Symons, Le Pere Corot by Robert Wickenden, Francisco Goya Y Lucientes by Charles Caffin, Daumier's Lithographs by Henry Seaver and William Makepeace Thackeray and Giovanni Battista Piranesi by Benjamin Burges Moore in slipcase. Black and White Illustrations. Items Similar To "On Prints and Printmakers 7 Booklets in Slipcase 1962"